Just back from a trip to Cavan, Leitrim and Down visiting friends and generally having a great time camping. Here’s a photo taken at my friends place, off the grid in Cavan. 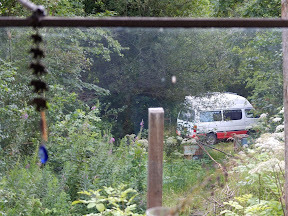 This picture is taken from a mobile home on his land, looking down into the forestry land where I was set up with the van. The mobile has a wood burning stove for winter heat as well as cooking, hot water etc. His cottage also has solar power (3 x 70 watt panels) and there is a compost toilet in the woods. It’s always been one of my favourite destinations to get away from city life.